Everybody’s coming or going this week. There is a very good possibility of excellent treats. Whether you will be Around Here or Away, going off over the river and through the woods or welcoming the relatives to your house, we wish you a fine, peaceful holiday. Babs Young writes: This time of day is probably my favorite time to take photographs. This was taken Saturday, the 17th with just the small moon among the branches. We’ve had nice weather for the last few days. I hope it continues. Happy Thanksgiving to each of you. Happy Thanksgiving Gerry & Babs. If Scott taught me nothing else, he certainly taught me about the “blue hour”, which is so beautifully shown in this photo. Poetic, isn’t it. Babs and Scott at the same Thanksgiving table – there’s a picture. Happy Thanksgiving to you, Gerry, from across Grand Traverse Bay. I trust that the Cowboy and Miss Sadie will get their share of excellent treats. Thank you, P.J. They always do. I hope this is a lovely week for you and David and Sarah. What a beautiful, peaceful photo. I’m not sure I’ve ever seen a more beautiful blue. And a Happy Thanksgiving to you, and Babs, and the Cowboy and Miss Sadie. May leftovers abound! We are bringing leftovers just in case. My God, how beautiful is that photo!! Makes me miss it up there and thankful that we can still enjoy such beauty! Happy Thanksgiving to all! Thank you – Babs is a wonder for sharing the wealth. 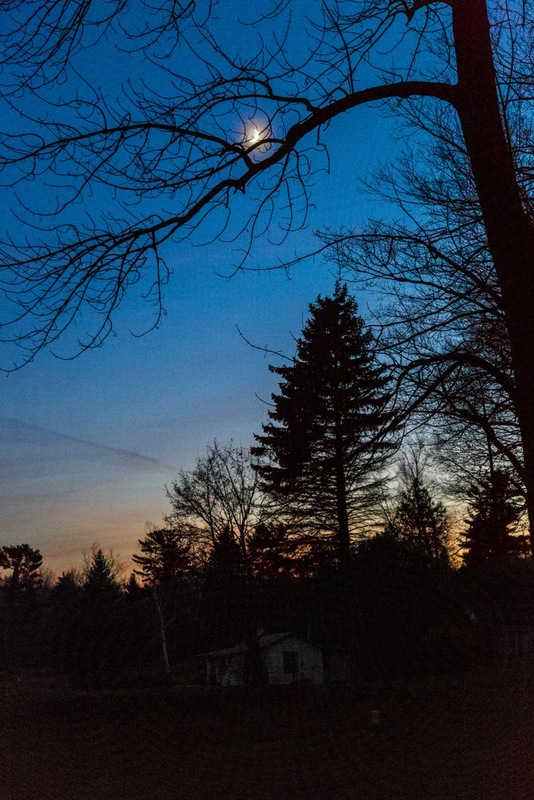 Ah, the start of blue hour is indeed a magical time for photography. Happy Thanksgiving to you, Gerry. Thank you, Scott, and to you as well. Happy Thanksgiving Gerry! Enjoy something yummy!! Hope yours is a safe, sane and happy holiday with plenty of friends, family, fellowship and goodies! Hope you and the duo had a wonderful day yesterday, Gerry. Late but with all my heart I hope you enjoyed a most pleasant Thanksgiving Day, Gerry. Bab’s picture was certainly a promise for a beautiful day. Gorgeous blue hour ! Just stopping by to say hello – been missing you down here in the south. Hope all is well and that your Thanksgiving was terrific! Well, as you might guess I had a most wonderful Thanksgiving. Rob the Firefighter and the Lady Alicia spoiled me completely rotten. I hope all of you had food that was as good and laughter that was as satisfying and stories that were as astonishing. I would tell you all about it, but I took no pictures at all. Not a one. If I’m lucky, no one else took any either.